The identity of the mysterious buyer of the Bond submarine has finally been revealed as Tesla’s Elon Musk. To mark the occasion, (or to use it as a flimsy attempt to make something we were going to do anyway look current), we’re going to be looking at submarines in film. First up, the brilliantly titled K-19: The Widowmaker. This is a true story about a soviet nuclear submarine in the 1960s. 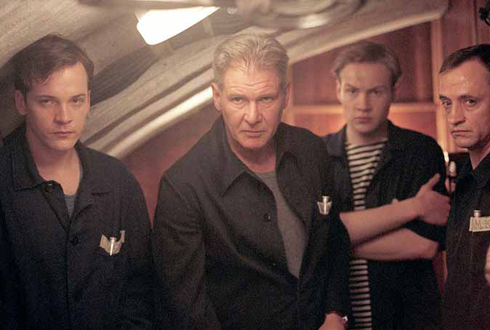 Captain Alexei Vostrikov (Harrison Ford) is brought in to replace the ship’s popular former captain Mikhail Polenin (Liam Neeson), who takes second place. Tensions run high between the two as the hapless crew lurch from crisis to crisis, born from their own collective incompetence. Let’s first get the good stuff out of the way: this film looks great. The submarine exterior looks fantastic and the interior creates an incredibly claustrophobic feel. It’s also reasonably tense in places, in scenes where bad things happen or almost happen. Right, now the bad stuff. Congratulations! You’ve been selected to serve aboard the Widowmaker! It goes for the “foreign people speaking English with their country’s accent” approach which is a pet peeve of mine, particularly here as none of the cast can pull off a convincing Russian accent. It’s not helped by the fact that Neeson and Ford both have very distinctive voices that neither of them is actor enough to alter, so those familiar with their work will instinctively hear an Irish and American accent respectively. But they’re both awful too. Ford in particular falls down on all the “r” sounds, like his entire training for playing a Russian was watching Chekov in Star Trek. Meanwhile Neeson sounds like Colin Farrell meets Rocky Balboa. Not only does Ford fail with his accent, he also fails to inject any kind of humanity into his character, wearing the same, fixed, angry, military expression for the entire film. The characters that aren’t these two are extremely peripheral, with most of the rest of the crew being indistinguishable from each other. The focus here is well and truly on the two big guys, which considering how two dimensional and underdeveloped they both are, really robs this film of an emotional anchor. The character arc of Vostrikov involves the tough and uncompromising captain seeing the error of his ways, but Ford’s performance, and his constant grumpy cat face, makes the guy seem like such a cantankerous old stick through the whole thing that it’s really hard to support him at any point. With the absence of real human drama, this film needs to compensate with a good plot or some juicy action, neither of which it delivers. Based on a true story, it feels constrained by the fact it was essentially an aborted mission that fizzled out, which doesn’t necessarily make the best film. It could have worked if we cared about the people involved, the standard of writing and acting isn’t high enough to make it work and it ends up feeling like it never really goes anywhere. Made in 2002, it feels like the kind of film that should have been left in the 90s. It’ll make you pray for the end of the Cold War just so Hollywood can start hiring actual Russians. But the Cold War ended in 1991, so there’s really no excuse. So while it has its moments, it’s sunk by its poor casting and underwritten characters. A sub par sub flick.